CINCINNATI (May 19, 2017) – The first of a two-phase Gorilla World expansion will be finished in less than three weeks! 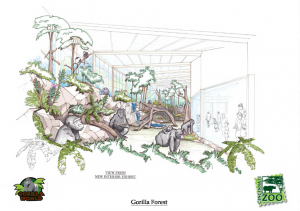 Starting this June, Cincinnati Zoo & Botanical Garden visitors will be able to see gorillas in an outdoor habitat that has been modified to make room for a new indoor facility that will be ready later this year. 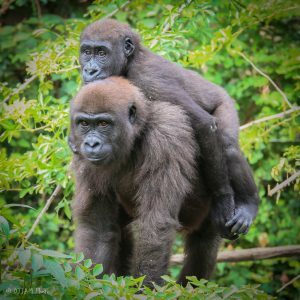 “We launched a fundraising campaign to expand Gorilla World in 2015 and have come a long way since we broke ground on the project last fall. We’re on track to complete the new indoor environment this fall and excited to get gorillas outside in a few weeks,” said Thane Maynard, Cincinnati Zoo Director. Phase one modifications include increased usable land space on one side of the resurfaced outdoor habitat, a more energy-efficient stream and waterfall, random rolling hills, new landscaping, and an improved space for colobus monkeys. 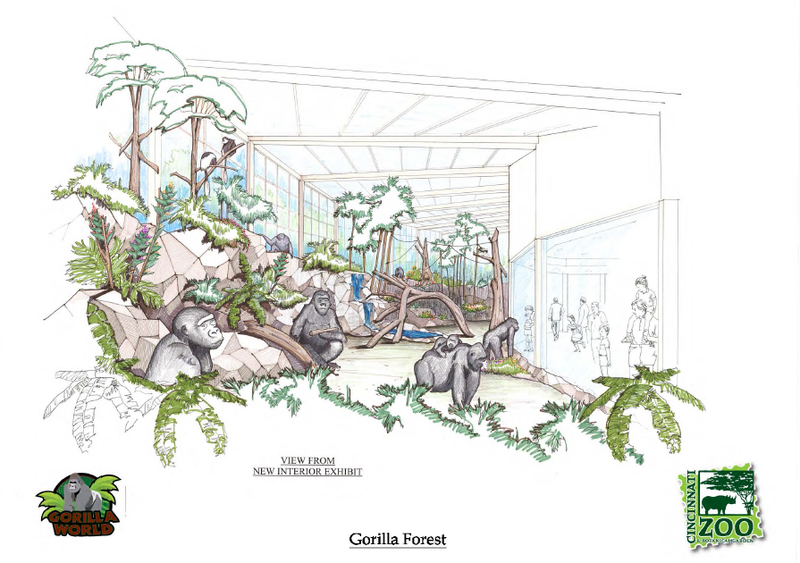 The less visible, but equally important, component of this part of the expansion includes modernized living areas for the gorillas and a new behind-the-scenes configuration that provides them with spatial variety and easy options to move past one another. family members. The opportunity for year-round viewing and engagement with gorillas will be an enormous hit with visitors. The new facility will help the Zoo continue to inspire gorilla conservation by getting visitors #CloseEnoughToCare. The Cincinnati Zoo has been caring for gorillas since 1931 and has made significant contributions to gorilla populations in Zoos across the country. Fifty gorillas have been born in Cincinnati since 1970, when the first two gorillas, Sam and Samantha, were born a week apart. Samantha still resides in our family group and can be seen, along with the fiftieth gorilla, two-year-old Elle (name chosen because L is the Roman numeral for 50), when Gorilla World reopens in early June. There are about 765 gorillas in zoos worldwide including approximately 360 in the Association of Zoos & Aquariums (AZA) Species Survival Program (SSP) for this species. Western lowland gorillas are critically-endangered in the wild, with less than 175,000 individuals. Due primarily to habitat destruction caused by logging, mineral mining and agricultural expansion, wild gorilla numbers continue to shrink. The bushmeat trade – the killing of wild animals to be used as human food – is also a major threat to the western lowland gorilla population throughout the Central African rainforests. Over 1,000 gorillas are illegally poached for the bushmeat trade each year. 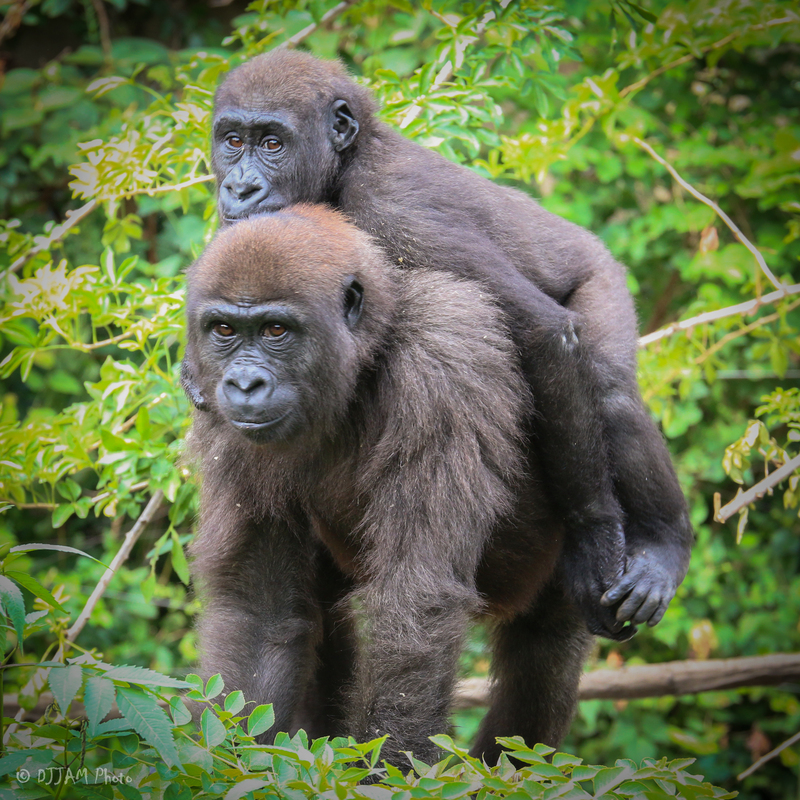 The Cincinnati Zoo supports wild gorilla conservation efforts like the Nouabalé-Ndoki Project in the Republic of Congo. This project includes the Mbeli Bai Study, the longest running research being done with wild western lowland gorillas. Through research, local education programs, publications and documentaries, the Mbeli Bai Study and other gorilla related efforts there are raising international awareness for gorillas and their struggle for survival. For more information, visit www.cincinnatizoo.org.